Andrea’s Famous Salsa! | What's Cooking at the Genua's? Many years ago (19 actually) when I received my first food processor I had no idea what to use it for. I still have the same exact Cuisinart Little Pro Plus and it still works great! The first thing I attempted to make it in was salsa. I first followed the recipe that came with the food processor but I quickly changed it to make it my now famous salsa. I have to admit my first attempt at salsa was almost a complete disaster. It was my first time dealing with jalapeno peppers. Nobody told me how dangerous they can be if not handled properly! Needless to say after cutting the peppers and scooping out the seeds I rubbed my eyes! I can feel all of you wincing now. It was like being sprayed with pepper spray only worse. My entire face looked like I had severe sunburn! I couldn’t open my eyes for a while until I totally flushed them with water. They still stung and my face burned as well. The only thing I got to work on the burn to my skin was aloe vera gel! So after this incident I handled peppers with extreme care and wash my hands often and I NEVER touch my face again!! It was a sight for sure! So the following recipe is what I finally ended up with and I even sold it for a bit to friends and co-workers. It can be frozen also but I recommend draining it a bit once it’s thawed out as the tomatoes hold tons of water. 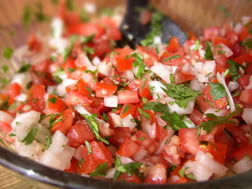 This salsa can be used on pretty much anything you want. It stays pretty long in the fridge also, not as long as a jarred salsa but it’s so much better and fresh. You can also adjust the amount of peppers to your liking or even change the type of pepper. I usually stick to jalapeno peppers. I have tried it with Habanero peppers also but of course cut the amount down a great deal. Enjoy! 1: Chop onion, garlic, cilantro and chili peppers in food processor. Transfer to a large bowl. 2: Place the tomatoes in the food processor and coarsely chop. If you want larger chunks of tomato cut by hand. Add to bowl with mixture. 3: Stir in vinegar. Add salt and pepper to taste. Mix thoroughly. Let sit for a couple hours for best results. If salsa is too watery just drain in a colander. This is a very low-calorie snack. The carbs are from the veggies so they are good carbs and it’s virtually fat-free.